i'm thinking about mixing it up with my type tuesday posts. for the next several, i'd like to feature lettering and type that i encounter personally. as you can probably imagine, i'm surrounded by a lot of great examples in my own home, at the office and in my day to day routine. consider it a lesson in appreciating your surroundings . 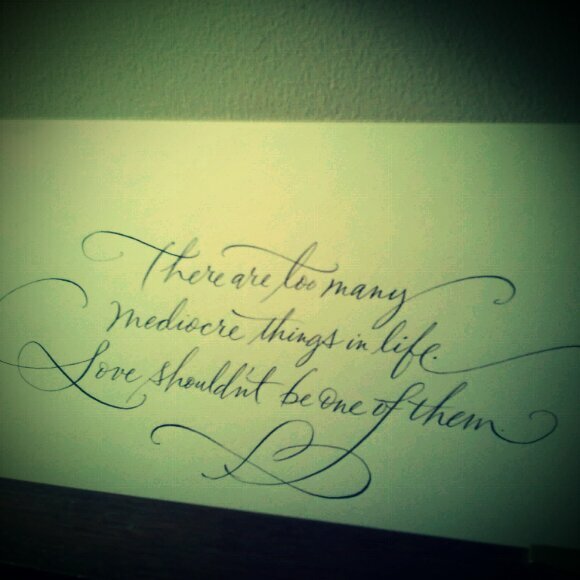 . .
first up, a gorgeous hand lettering sample by one of my uber talented co-workers. he lettered this for me around the time i got married (almost 2 years ago!). i've finally found the perfect place for it, so it's time to get it framed. gorgeous! i WISH i could do this! i have this quote saved on my computer :) i love it. Wow! That is stunning...both the lettering and the quote!